Starring John Miles, Patricia Barry (Patricia White), Walter Kinsella, Frank Tweddell, Arthur L. Jarrett, Lewis Charles, Jack Lord. Written by Phillip H. Reisman, Jr.
One might really think that Howard Hughes at RKO was following instructions from a book called "How to Drive a Great Film Studio Straight Into the Ground". In his initial year of ownership Hughes fired most of the work force and restrained his production personnel from making any headway whatsoever. He sold his older personal films to the studio for a profit and bought the work of outside providers while slowing in-house production to a crawl. Plenty of projects were planned and budgeted, but Hughes' personal approval was needed for every decision, and he was notoriously unreachable. Spending fortunes in insanely unproductive ways, Hughes did approve features starring Robert Mitchum and Jane Russell, while a number of micro-budgeted crime films were green-lit as well. One of these was 1950's The Tattooed Stranger, apparently made as a cost-cutting experiment by RKO's short subjects department. This is producer Jay Bonafeld's only feature; he rode out the last seven years of RKO doing more shorts and finished his career by supervising the English dubbing job on the Toho pickup The Mysterians. When RKO finally closed its doors, that movie ended up being released by MGM. 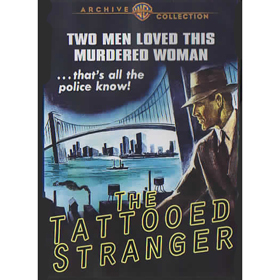 The Tattooed Stranger's price tag was only $124,000 -- a pittance for a show filmed outside the studio gates, let alone on the streets of New York City. The script by Philip H. Reisman, Jr. is a reworking of a short subject called This is America: Crime Lab. Director Edward Montagne began as an assistant director on early W.C. Fields talkies; in his old age he became a prolific TV producer. The accomplished cameraman William O. Steiner also filmed short subjects but was noted as the cinematographer on Ted Tetzlaff's acclaimed The Window from the year before. 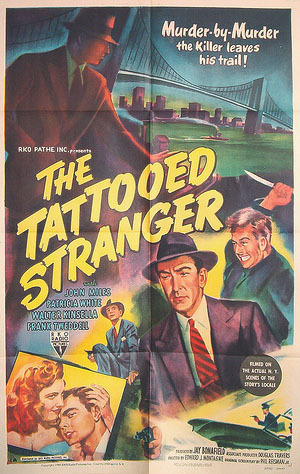 The Tattooed Stranger came and went very quickly in 1950, a year that RKO released almost no profitable films. Being too brief for most television syndication, it was mostly forgotten until Turner Classic Movies cable came along to provide a showcase for the arcane and unusual. Producer Bonafeld hired some New York acting pros but no names to put on a marquee. The "star" of the show is New York City itself, as only a stripped-down documentary crew could film it. On-location thrillers were still in vogue in 1950, but the expense of fielding a full film company in a far flung city encouraged studios to use clever tricks to blend location work with scenes filmed on Hollywood back lots. The Tattooed Stranger roams all over Manhattan and Brooklyn among ordinary civilians going about their business. Its story may not be as compelling as that of The Naked City, but every shot of city sidewalks and café interiors is like a time machine to an earlier era. The story basically shows how science aids the detection of a killer. A woman is found shot-gunned to death in Central Park, a "cold dame in a hot car". Her purse has been emptied of identification, and all the cops have to go on is a Marine Corps tattoo on her wrist. Experienced Lt. Corrigan (Walter Kinsella) is at first disdainful of his new partner, "college boy" Detective Tobin (John Miles). A habitual wino is caught in the autopsy room trying to remove the telltale tattoo with a knife, and is shot dead before he can reveal who hired him. Corrigan and Tobin get nowhere until clues from the crime lab begin to steer them in the right direction. Mud from the brake pedal of the car proves to be grinding sand used by stonecutters. Tobin takes blades of grass found on the floor of the car to a museum, where pretty botanist Mary Mahan (Patricia Barry; later Patricia White) identifies it as a variety found only in the Midwest -- but also in a sample taken a few years ago in a corner of Brooklyn. Following up another long-shot clue suggesting that the victim may have been a waitress, Corrigan begins canvassing eateries, first in the Bowery and then in Brooklyn. As they tighten the net, neither detective suspects that their suspect is closer than they think. The unknown killer carries his shotgun wrapped in newspapers, ready for use. The Tattooed Stranger has few stylistic elements that would categorize it as a film noir. The characters are uncomplicated and the hunted killer remains a mostly off-camera threat. We stick with the cops all the way through. Neither the script nor the visuals suggest themes of alienation, anxiety or social sickness. Although we are always told in these proto- CSI police procedural movies that the science lab work is authentic, the clues followed here are more believable and less sensational than those in John Sturges' noir thriller Mystery Street from the year before. The Sturges film's noir lighting looks decidedly glamorous when compared to the gritty views of the city seen here. The only nagging point is that the film's most suspicious characters tend to be "untrustworthy" immigrant types -- a surly café owner, and a shifty stonemason. Part of the fun is comparing police culture circa 1950 with the glam-rock version of crime investigation seen on TV today. Most of the NYPD personnel look to be over 40, and those with authority are even older. They are all hardworking and honest. The cops dress unimpressively, with the most important wardrobe item being a good pair of shoes for all that arch-busting legwork on those hard sidewalks. The 'college boy' Tobin puts up with a certain amount of razzing. Tobin was a serviceman just five years before, but Corrigan assumes that he's completely green and inexperienced. Only the supervisors realize that the department needs new blood and new methods. Young Tobin is taking all this like a gentleman when he meets the attractive botanist, Mary. Then he starts in with remarks that presume that a pretty girl like Mary just doesn't seem "the type" to be cooped up in the basement of a museum with a million specimens of flora. Mary isn't insulted when Tobin hovers around her making light of her procedures, but instead removes her glasses , indicating that she's interested. The cute second-generation Irish flirtation only becomes questionable when Tobin brings Mary along on potentially hazardous interviews. The Tattooed Stranger's low-key tone is its strength. Kinsella and Tobin swap relaxed small talk, in contrast to the uptight tension in the then-popular Dragnet radio show. Kinsella jokes about Flora and Fauna when he sees the youngsters hitting it off, and there's an offhand running gag about a tattooed WAC Tobin supposedly knew back in the Air Corps -- nothing particularly witty, but the kind of talk these people might actually engage in. Howard Hughes liked police stories and he loved fliers -- we can imagine him okaying The Tattooed Stranger based upon the mere mention of air service in the war. Director Montagne doesn't build any great suspense but handles things in a matter-of-fact way. The people are likeable and even the non-actors come off fairly realistically. The sole featured player to follow with a long career is Patricia Barry, who as Patricia White never stopped working in films and TV. Ms. White plays the terrified mother in the Joe Dante episode of Twilight Zone: The Movie. Without any lines but unmistakably present in several close-ups is a very young Jack Lord as another detective. Lord's first appearance was in another RKO short subject, an anti-Communist piece produced by Jay Bonafeld. This was the actor's third feature bit part before spending several years in Television. The Jane Doe mystery corpse turns out to have been a busy "Allotment Annie", and the shotgun killer a sailor incorrectly listed as killed at sea. The show finishes with a fairly exciting shoot-out but is more interesting as a window on an earlier time, free of most of the usual Hollywood hype. Unlike today's widespread tattoo culture, the parlors visited in this show are grim fleapits where tired-looking men work on guys who don't look like they take baths. Corrigan eyes one hairy Joe covered with a collection of markedly un-artistic ink designs, and says to his face, "You're disgusting!" Now that's old-fashioned New York etiquette. The sketchy cover art for the disc is a great evocation of the film's spirit. Historians will tell you that 'police procedural' movies of this kind mostly overtaken by popular Television dramas. But I've never seen a '50s cop program done with this kind of care and on-the-street credibility. 1. Hey, the things we uncultured Californians learn about New York by watching movies! DUMBO is an acronym for the "Down Under the Manhattan Bridge Overpass" section of Brooklyn.